FGEF306TMF Color: Stainless Steel Features: -The Gallery Series 30 In. 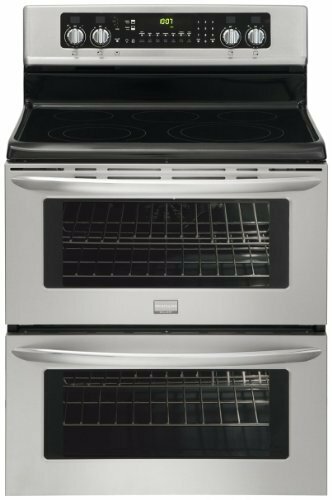 Electric Smoothtop Freestanding Range feature Symmetry Double Ovens, which are each large enough to cook a 28-pound turkey or multiple dishes at different temperatures for maximum cooking flexibility. They also feature a series of preset options to make cooking easier, including Chicken Nuggets, Pizza, Keep Warm, and Self-Clean. The Effortless True Convection takes the guesswork out of convection cooking by doing the converting for you. Plus, Space Wise expandable elements allow you to adjust the size of some of the cooktop elements, ensuring the element is the perfect size for any pot or pan, and preventing accidental burning of hands..